However the reason for doing live performances of these films goes far beyond their place in popular culture. Each of these films features a magnificent score by John Williams, the Boston-based composer who rose to national prominence with his 1975 score for Jaws. 1977 brought Star Wars (later retitled Episode IV: A New Hope; showing Sept. 15-16), which draws freely on the orchestral music if the 19th and 20th centuries, creates an utterly absorbing world through its music: from the majestic trumpet-and-trombone driven opening fanfare to the taut battle music and romantic horn solo depicting the youthful yearnings of a young Luke Skywalker. Williams' scores for these films have been criticized in the past for being derivative. And yes they are. George Lucas' creative process was to screenwrite while listening to Strauss, Holst and Wagner. He'd make a note and tell Williams: "write something like that piece. So it is possible to hear the muted brasses of Stravinsky in the scene with the Jawas (small scavenger aliens) and the droids (robots) in the first picture. The "Star Wars theme," with its ascending horn call associated with Luke (Mark Hamill) recalls Wagner's Siegfried, as does the would-be young pilot being stuck at home working on his Uncle Owen's moisture farm. Its pensive second half, played mostly on English horn, becomes the theme for Obi-Wan "Ben" Kenobi (Alec Guinness) the Jedi Knight who becomes Luke's teacher and protector. In the scene where Luke finds his aunt and uncle slaughtered, the Dies Irae roars forth in the orchestra, marking childhood's end. As Luke's world expands, the music does too. The "Cantina Band" (they are actually called "Fig'rin Dan and the Modal Nodes," for you fanboys) brings vibrant jazz rhythms, with slippery, comic clarinets and bassoons sounding distorted and yet familiar. The swashbuckling Han Solo (Harrison Ford) and his furry sidekick Chewbacca (Peter Mayhew) are introduced. Washes of trumpets and an ominous three-chord theme (similar to the opening of Strauss' Elektra) introduce the Death Star, the huge space station whose destruction forms the plot arc of this movie. The big burly rhythms of the space battles in the first movie are Stravinskian as well, specifically the slamming percussive chords of the The Rite of Spring that show up as the Rebels take on the Imperial forces in a pitched dogfight above the metallic surface of the Death Star. Three years later, Williams' score of The Empire Strikes Back (Sept. 26-28) expanded the films' sonic palette. There was even more brass and percussion, and the introduction of the Imperial March, a pounding, insistent theme with the strength of a construction site pile driver. (Ironically, its cross-rhythms are an inversion of the triumphant throne room scene at the end of A New Hope.) 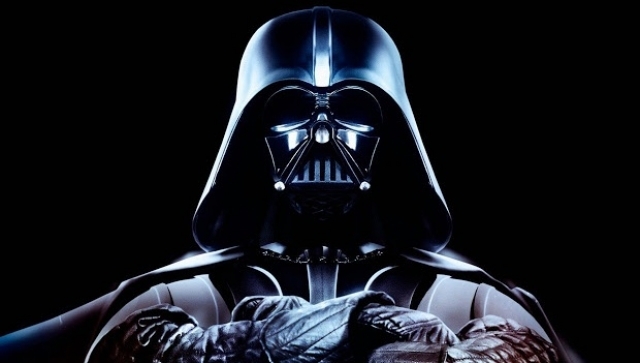 There is a terrifying insistence in its triple-duple rhythm, with the relentless trombones indicating the presence of the movie's villain, Darth Vader. (David Prowse, voice by James Earl Jones) This music of despair contrasts with the serene themes of Master Yoda (Luke's diminuitive teacher) and the lush, romantic music for Han Solo and Princess Leia (Carrie Fisher) the saga's star-crossed lovers. This score is the most Wagnerian of the series. With Return of the Jedi (Oct. 4-5) the concluding film of the original trilogy, Lucas pulled out all the proverbial stops. There's a bigger, badder version of the Death Star, the space station from the original film. There's a long opening with the heroes taking on the morbidly obese gangster Jabba the Hutt and his nightmare palace filled with monstrosities. And there's the Ewoks, the "cute", "cuddly" walking teddy bears who look adorable but fight like the Viet Cong. The music is equally diverse, incorporating woodwinds, tribal rhythms and a lush, full development of the themes for Luke, Leia and Han Solo. In the climax of the film, as Darth Vader meets his fate, one hears a last touch of the Imperial March theme, now a lilting funeral ode played on the harp. The final film of the four-movie festival is Star Wars: The Force Awakens (Oct. 6-7) the seventh episode in the series. (Like much of Star Wars fandom, the Philharmonic are electing to pretend that the prequel trilogy does not exist, did not happen, and deserves being ignored. That's a mistake: it has excellent music.) Here, one hears Williams recycling many themes from Episodes IV-VI, filtered through a new sensibility and denser musical vocabulary. He also incorporates the choral style from the three prequel films, particularly for the scenes with Kylo Ren. The tone of this picture is darker, with harmonic uncertainties heard under new themes for young heroes Ren (Daisey Ridley) Finn (John Boyega) and Poe Dameron (Oscar Isaac), as well as the villainous Kylo Ren (Adam Driver). This last character gets the most interesting music: he is the grandson of Darth Vader, the son of Han and Leia, and a figure who curiously diminishes over the course of the film.